Universally speaking, money is an uncomfortable subject – be it with friends, family or in the workplace. In fact, the “pay” conversation that managers are required to have with their employees might be one of the most unanticipated talks of the year. Managers have the very sensitive responsibility of playing middleman between HR and employees to discuss everything from raises to bonuses (or lack thereof). They have to follow strict guidelines regarding pay, but they also want to keep their teams happy and engaged. So where’s the sweet spot? Officevibe took a trip down to Austin to attend Compference, a two-day conference put on by the industry experts at PayScale. What we learned will help you get rid of the pay talk woes, once and for all. The top reasons why communicating pay context is essential. 3 things managers must be trained by HR to understand about pay. The truth about pay and employee engagement. When having difficult conversations with employees, it’s not only about what you say, but how you say it. 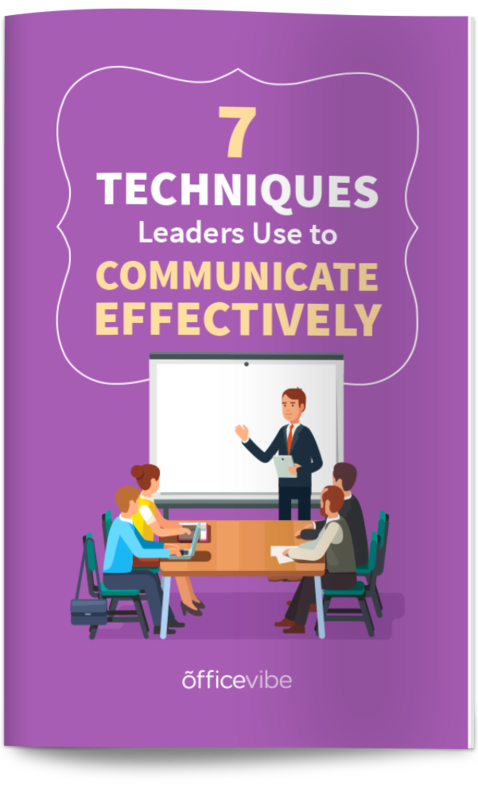 Learn The top 7 communication techniques used by leaders to have positive and effective conversations with employees, every time. The operative word in these stats is “believe”. They are assumptions, because they don’t know the context – and this is the problem. So why is context so important? First off – Giving context helps put things into perspective and it explains the “Why” behind the number amount that they are being given. Secondly – no one likes being kept in the dark about things, especially when it comes to the rationale behind the way that someone values you. Imagine being assigned a number but having no understanding of its meaning. It can be crazy-making for employees, and a waste of space in their daily thoughts. Thirdly – Imagine how managers must feel needing to relay a number packed with significance, with no real understanding of how to explain it. It’s like asking someone who has never watched a hockey game to commentate on a match. Pay is a highly sensitive subject as it is, so relaying the wrong information, or even expressing the right information in the wrong way can contribute to your employees losing trust. When you discuss someone’s worth and value in whatever terms it’s not so cut and dry – there are feelings involved – so managers need to be able to give a proper, thorough explanation. Employers today should arm managers with accurate market data reflecting talent markets to base the conversation in fact. Finally, they need to remember that how their employees feel about compensation matters just as much as what they’re actually being paid. When it comes to having a more engaged workforce, you can’t assume that an employee’s perception about pay matches reality. What are the risks of not communicating pay? Simply put, employees will come up with their own conclusions about the pay they’re given. And when our minds are left to wonder, the conclusions we come up with can travel so far off base into the territory of resentment. A whopping 35% of people who are paid above market have no idea that this is the case! In fact, they think that they are paid below market. This means that the problem isn’t necessarily about money itself, it’s about the way we communicate it. There is a huge disconnect between reality and perceived reality when it comes to pay, and the consequences of this lack of transparency are that employees leave your company in search of what they think is better. It’s time to get the conversation flowing to bridge the gap between what HR understands about pay, and what employees don’t. Managers, this is where you come in, and this is what you need to know. If you aren’t already getting the training, ask for the proper explanation behind the numbers you’re asked to share! It will make all the difference in your relationship with your team. Essentially, the compensation philosophy of your organization is tied to its core values and goals. Managers need to be able to answer all questions employees might have about pay in line with this strategy so that there is cohesion across the board. Why this specific percentage increase? Why did I get a bonus of this amount? How much will my pay increase next year? The more context employees get surrounding these questions, the more they will act as an ambassador for your company, rather than a detractor because where there is understanding, there is appreciation. Pro Tip: You want to inspire your employees to continue to work hard. When you explain their raise or bonus, be sure to also explain their value to their organization and recognize them in non-monetary terms. Managers need to be trained to understand how the company is positioned in the market. Being able to explain this to existing employees acts a retention tool. Remember, context trumps everything. Pro Tip: The market is in constant motion. Keep up to date on what’s happening in the industry so you’ll be equipped to answer any compensation questions that your employees have throughout the year. HR needs to offer guidance for not only how to discuss pay with new candidates coming in, but internally as well. You may have attracted great talent, but now you need to keep them and one way to do this is to keep yourself and your team informed on how you compensate. Pro Tip: Decouple conversations about pay and performance. Performance should be tied to development and personal growth, while pay to market standards. When you put them together, learning becomes extrinsically motivated, which removes authenticity from the process. This is really important to clarify. We’ve come to understand through recent research that people (for the vast part millennials) don’t only care about salary when looking for a job. Money isn’t everything. They want to learn, grow, connect with their colleagues and be part of something big. They want purpose and meaning in their day-to-day. But, this doesn’t mean that pay isn’t important, or that employees are willing to settle for less than what they deserve. It means that only once they are paid fairly and feel valued at the root, they tend to care more about growth than they do about money. Compensation at the end of the day is the story of how much an organization values their employees, and unfair compensation, whether perceived or real, could drive employees to leave said company. Pay is a crucial component of engagement because it’s not just a number; it’s an emotional measure reflecting how valued an employee feels by their employer. Just like every member of an organization – from its employees to its CEO – is responsible for embodying the company’s culture and values, every member of an organization should understand the company’s pay brand, because it is likewise part of the culture. How do you appoach the pay conversation? Share your tips below!